In Mammoth Adult Curling League action on Tuesday, January 29, defending champion Crowley Curlers beat Short and Curly. Forgive Short and Curly. It’s their inaguraul season. They’re figuring out the proper lemon to honey ratio in their Hot Toddies. The Crowley Curler’s wore beanies adorned with pink hair curlers (see page 12 for photo). An investigation lead by the league’s commissioner Lauren Plum determined that the curlers on the beanies did not enhance telepathy nor transmit mind altering radio waves to opponents. The Crowley Curlers took a 2-1 lead. After two more ends, it was 4-1. The Crowley Curler’s called the sides the ‘fast lanes’. Short and Curly’s comeback strategy was to hope. They lost, 1-8. “They’re like the Patriots,” Short and Curley’s Mike Wong said. “We’re the Dolphins. Crowley Curlers and Short and Curly have 3-2 records on the season and are part of a three-way tie for first, along with Jheri Curl in the Blue Division. Crowley owns the tiebreaker, having scored more points than the other two teams. The sport is like giant shuffleboard on ice. The goal is to score the most points. Points are scored by throwing a stone closest to the center of the house, which is called the button. The team with a stone closest to the button scores. They add up all of their stones that are closer than their opponents closest stone, annd that is their score for the end. The house is four concentric circles at the opposite end of the sheet. To throw, a player holds the stone in a low lunge, imagine trying to stretch a hip flexor. They then push off a “hack” with their back foot. The lead foot on a “slider” slides forward. The player slides with their stine up to the hog line and releases. 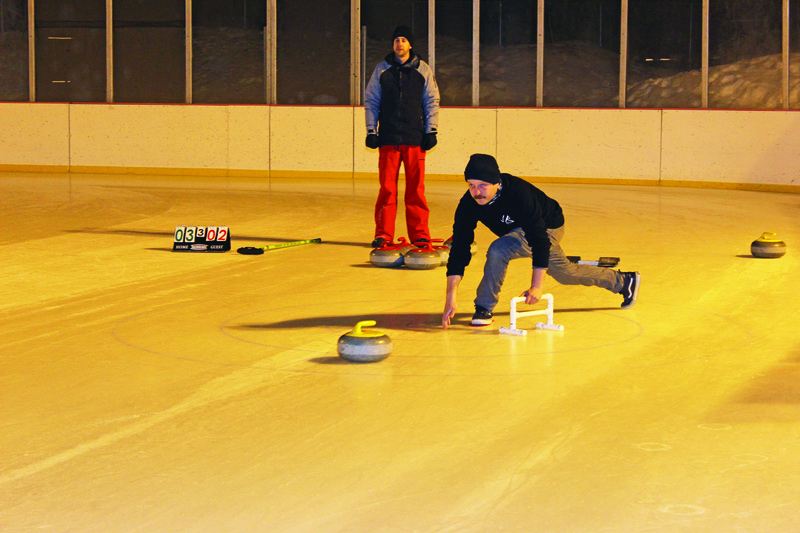 Once the stone is released, teammates with brushes can sweep the ice in front of the stone to speed it up or change its direction. “It’s hard like darts is hard,” Short and Curly’s Ryan Carey said. On the other sheet, the Jheri Curls took on I Think I’m Going To Curl. The Jheri Curls consisted of employees from June Lake Brewing and Green Mammoth. I Think I’m Going To Curl consisted of staff from Mammoth Hospital. It was the doctors verse the bartenders, care versus corruption, virtue versus vice. Like an old western, good and bad were starkly defined and were wrapped in a cosmic struggle representative of our human condition. Dr. Craig Burrows, the Chief Medical Officer for Mammoth Hospital, brought the members of I Think I’m Going To Curl together out of necessity. He heard there was curling at the Mammoth rink and went to try it out, but when he showed up at registration they said, where’s your team? One might think the steady-handed surgeons should have been favored against the boozing bon vivants at this game of finesse. Not so. I Think I’m Going To Curl came into the match with a record of 1-3 to the Jheri Curls 2-2. After a mediocre first two ends, the Jheri Curls found their stride when a well placed heavy from Kevin “The Ringer” Gain netted them two points and the lead. While the hospital team was meticulous, the Jheri Curls had a secret weapon: the JLB hooch they kept pouring into their insulated water bottles. The juice had them loose, and it showed. Skipper Alex Kirkpatrick began cracking the whip in the fourth end to motivate his brushers, “Sweep you stoner,” Kirkpatrick shouted at teammate Jon Thayer. The Jheri Curls did not relinquish the lead and finished the match with a victory 5 points to 3. Vice won out again over virtue. Health is nice, but beer is better. Kirkpatrick said he is happy that Mammoth has decided to put this tournament on. There is one more regular season game in the tournament, and then the double-elimination tournament begins on February 10.